Imaginal progenitors in Drosophila are known to arrest in G2 during larval stages and proliferate thereafter. Here we investigate the mechanism and implications of G2 arrest in progenitors of the adult thoracic tracheal epithelium (tracheoblasts). We report that tracheoblasts pause in G2 for ~48–56 h and grow in size over this period. 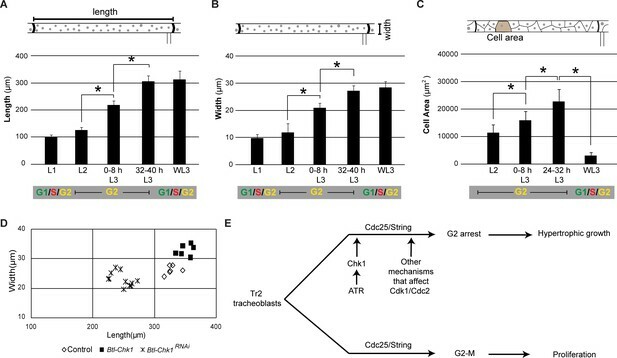 Surprisingly, tracheoblasts arrested in G2 express drivers of G2-M like Cdc25/String (Stg). We find that mechanisms that prevent G2-M are also in place in this interval. Tracheoblasts activate Checkpoint Kinase 1/Grapes (Chk1/Grp) in an ATR/mei-41-dependent manner. Loss of ATR/Chk1 led to precocious mitotic entry ~24–32 h earlier. These divisions were apparently normal as there was no evidence of increased DNA damage or cell death. However, induction of precocious mitoses impaired growth of tracheoblasts and the tracheae they comprise. 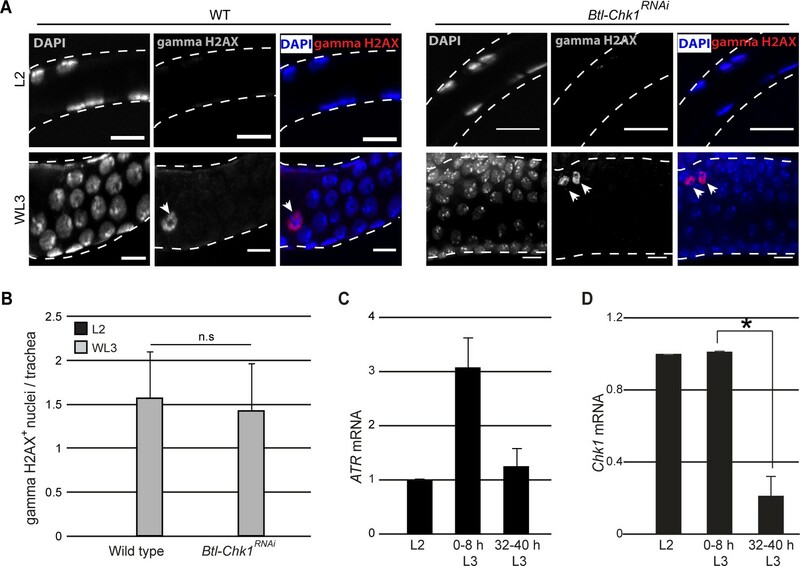 We propose that ATR/Chk1 negatively regulate G2-M in developing tracheoblasts and that G2 arrest facilitates cellular and hypertrophic organ growth. Every organism begins as a single cell. That cell, and all the other cells it generates over time, need to divide at the right time and in the right place to develop into an adult. As they do so, they pass through the stages of the cell cycle. As cells prepare to divide they enter into the first growth phase, G1, ramping up their metabolic activity. They then enter S phase, duplicate their DNA, and subsequently a second growth phase G2. Finally, during the mitotic phase, the chromosome separate and cells undergo cytokinesis to form new cells. Dividing cells can pause at certain stages of the cell cycle to assess whether the conditions are suitable to proceed. The length of the pause depends on the stage of development and the cell type. Signals around the cell provide the cues that it needs to make the decision. The fruit fly Drosophila melanogaster, for example, undergoes metamorphosis during development, meaning it transforms from a larva into an adult. The larva contains small patches of ‘progenitor’ cells that form the adult tissue. These remain paused for various intervals during larval life and restart their cell cycle as the animal develops. A key challenge in biology is to understand how these progenitors pause and what makes them start dividing again. Here, Kizhedathu, Bagul and Guha uncover a new mechanism that pauses the cell cycle in developing animal cells. Progenitors of the respiratory system in the adult fruit fly pause at the G2 stage of the cell cycle during larval life. Some of these progenitors, from a part of the larva called the dorsal trunk, go on to form the structures of the adult respiratory system. By counting the cells and tracking their dynamics with fluorescent labels, Kizhedathu et al. revealed that the progenitor cells pause for between 48 and to 56 hours. Previous research suggested that this pause happens because the cells lack a protein essential for mitosis called Cdc25/String. However, these progenitors were producing Cdc25/String. They stopped dividing because they also made another protein, known as Checkpoint Kinase 1/Grapes (Chk1/Grp). Chk1 is known to add a chemical modification to Cdc25, which dampens its activity and stops the cell cycle from progressing. This is likely what allow the flies to co-ordinate their development and give the cells more time to grow. When Chk1 was experimentally removed, it reactivated the paused cells sooner, resulting in smaller cells and a smaller respiratory organ. This work extends our understanding of stem cell dynamics and growth during development. Previous work has shown that cells that give rise to muscles and the neural tube (the precursor of the central nervous system) also pause their cell cycle in G2. Understanding more about how this happens could open new avenues for research into developmental disease. The precise regulation of cell division in space and time is essential for normal development. This is achieved by the integration of developmental signals and the machinery that drives cell cycle progression. Non-cycling cells are known to pause in G1 (or G0) (Cheung and Rando, 2013) or, less commonly, in the G2 phase (Bouldin and Kimelman, 2014) of the cell cycle and rekindle a mitotic program at the appropriate time and location. G2-arrested cells have been observed in developing Drosophila (Johnston and Edgar, 1998; Ayeni et al., 2016), Ciona (Ogura et al., 2011), zebrafish (Nguyen et al., 2017), chick (Boije et al., 2009; Stone et al., 1999) and mice (Seki et al., 2007). In this study we investigate the cell-intrinsic mechanisms underlying developmental G2 arrest and the significance of this mode of arrest in the context of the Drosophila tracheal (respiratory) system. Fruit flies undergo a complete metamorphosis during their life cycle and have distinct larval and adult body forms. Progenitors of the adult animal (hereafter referred to as imaginal progenitors) are set aside during embryonic development, nourished in the larva, and activated during the larval-adult transition (Cohen et al., 1993). These progenitors generate adult organs de novo (sensory organs, wings, legs) or by remodeling larval organs (gut, abdominal epidermis, tracheal system). Imaginal progenitors of different tissues may either proliferate throughout larval life or in a punctuated manner. The progenitors of the abdominal epidermis (histoblasts)(Ninov et al., 2009), and the thoracic tracheal (respiratory) system (Djabrayan et al., 2014; Guha et al., 2008; Sato et al., 2008; Weaver and Krasnow, 2008; Pitsouli and Perrimon, 2010) exhibit the latter pattern. These cells remain mitotically arrested in G2 through most of larval life and initiate a program of rapid cell division and morphogenesis thereafter. The mechanism for G2-M is highly conserved among eukaryotic cells (Bouldin and Kimelman, 2014). The G2-M transition is triggered by the dephosphorylation of the Cyclin-dependent Kinase Cdc2/Cdk1 by the phosphatase Cdc25. Dephosphorylation of Cdc2/Cdk1 by Cdc25 results in the activation of the Cdk-Cyclin B complex and in turn to the phosphorylation of substrates in the cytoplasm and nucleus and to mitotic entry. G2-arrested progenitors of sensory organs (SOPs) in Drosophila have been shown to repress Cdc25/String (Stg) expression (Johnston and Edgar, 1998). 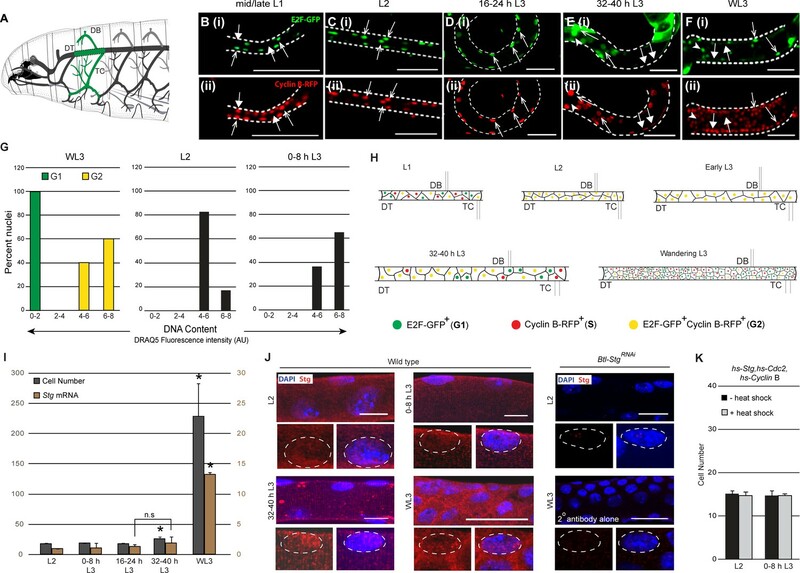 A recent study showed that SOPs forced to divide precociously undergo normal neuronal differentiation but generate supernumerary non-neuronal sensory organ support cells. Taken together, studies on SOPs show that G2 arrest is mediated by the transcriptional repression of Stg and that the arrest ensures that a proper balance of cell types within each sensory organ is achieved (Ayeni et al., 2016). Whether other G2-arrested progenitors in Drosophila and in other organisms are regulated like SOPs is an open question. Histoblasts appear to be regulated in a similar manner. Non-cycling histoblasts lack Stg expression and upregulate Stg in an ecdysteroid signaling-dependent manner during G2-M(Ninov et al., 2009). In the sea squirt Ciona, progenitors undergoing neurulation are known to arrest in G2 (Ogura et al., 2011). The overexpression of Stg in these cells triggers precocious G2 exit and perturbs the formation of the neural tube (Ogura et al., 2011). This suggests that G2-arrested neural progenitors in Ciona may be regulated in a manner akin to SOPs. A recent study on the muscle stem cells that contribute to the growth of the zebrafish myotome has shown that these cells arrest in G2 but utilize a different mechanism for arrest. G2-arrest in this context is mediated by Meox1-dependent repression of Cyclin B expression (Nguyen et al., 2017). Proliferating cells in the G2 phase that are subjected to DNA damaging agents stall cell cycle progression, initiate DNA repair, and rekindle the cell cycle after repair is completed (Branzei and Foiani, 2008). Cells with DNA damage utilize other mechanisms for G2 arrest. Genotoxic stress leads to the activation of the phosphoinositide-3-kinase-related kinases ATR and ATM that phosphorylate and activate Checkpoint Kinases 1 and 2 (Chk1,2) respectively(Kumagai et al., 2004; Chaturvedi et al., 1999). Chk1 and Chk2, in turn, inhibit Cdc25 and arrest cell cycle progression (Xiao et al., 2003; Chaturvedi et al., 1999). In addition, Chk1 can also stabilize the Wee/Myt kinases that phosphorylate and inhibit Cdc2/Cdk1(O'Connell et al., 1997). While there is evidence that ATR/Chk1 can regulate cell cycle progression in cultured cells in the absence of induced DNA damage (Sørensen et al., 2004; Tang et al., 2006) and during early embryonic development (Sibon et al., 1999; Sibon et al., 1997; Su et al., 1999; Liu et al., 2000) their roles in developmental G2 arrest have not been fully explored. In this study we focus on the progenitors of the adult thoracic tracheal system (tracheoblasts). 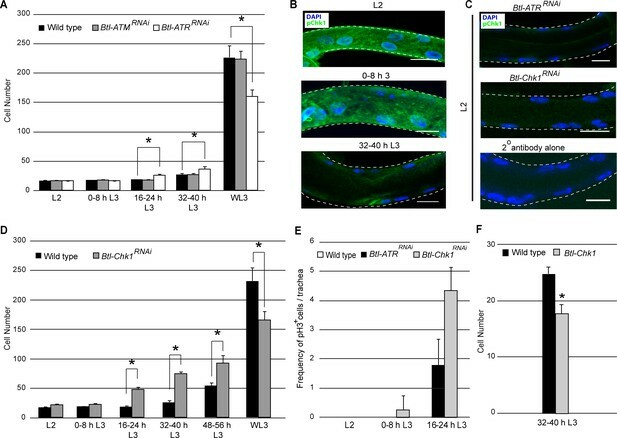 It has been reported that tracheoblasts arrest in G2 during early larval life and rekindle a mitotic program at the onset of the pupal period. Our efforts to determine precisely when tracheoblasts enter and exit G2 showed that the cells enter larval life in G1, transition from G1 to G2 in the first larval instar (L1) and remain in G2 till the mid third larval instar (L3), a period of ~48–56 h, whereupon they enter mitosis. We investigated the status of Stg expression in G2-arrested tracheoblasts to find that these cells express Stg throughout. Moreover, we observed that paused tracheoblasts also expressed Cdc2/Cdk1 and Cyclin B. These findings alerted us to the possibility that G2 arrest is not mediated via transcriptional repression of Stg, or of the essential drivers for G2-M, and led us to investigate alternate mechanisms. The findings presented here show that the G2-M transition in tracheoblasts is negatively regulated by ATR (mei-41, hereafter ATR)/Chk1 (Grapes (Grp), hereafter Chk1), that the transition involves the coordination of several processes including the downregulation of Chk1, and that arrest in G2 facilitates cellular and organ growth. The tracheal system of the Drosophila larva originates in the embryo from a pair of placodes in each segment. Each placode undergoes branching morphogenesis to generate tracheal tubes that anastomose at stereotyped locations and generate a connected network. The larval tracheal system is largely comprised of cells that undergo repeated cycles of endoreplication and are post-mitotic. In addition to serving the oxygen demands of the larva, the larval tracheal network also serves as a scaffold for the development of the tracheal system of the adult fruit fly. Embedded in larval tracheae, at stereotyped locations, are imaginal tracheal progenitors. These cells remain mitotically quiescent through larval life and proliferate and replace larval cells during metamorphosis (Pitsouli and Perrimon, 2010; Weaver and Krasnow, 2008). The progenitors that contribute to the development of the thoracic tracheal system of the adult animal, specifically progenitors of the second thoracic metamere (Tr2), are unusual. To the best of our knowledge, majority of the cells that populate Tr2 tracheae during larval stages are also imaginal progenitors (Figure 1A, shown in green)(Guha et al., 2008; Sato et al., 2008). Unlike post-mitotic larval tracheal cells, the cells that comprise Tr2 tracheae are mitotically competent, remain paused in G2 during larval life, and rekindle mitoses in the third larval instar (L3)(Guha et al., 2008; Sato et al., 2008; Djabrayan et al., 2014). Tracheal progenitors arrested in G2 express Cdc25/String. (A) Diagram of a third instar larva (L3) showing the tracheal branches in the second thoracic metamere, Tr2 (green). Dashed lines indicate the Tr2 Dorsal Trunk (DT) segment. (B–F) Expression of FUCCI reporters E2F1-GFP (green, arrowheads B(i)-F(i)) and CyclinB-RFP (red, filled arrows (B(ii)-F(ii)) at different larval stages. Double-positive cells are indicated with open arrows. Scale bar = 50 µm. (G) Comparison of the DNA content of mitotically active cells in G1 and G2 (left panel, cells from Tr2 DT at the wandering L3 stage staged using FUCCI) and G2-paused cells in Tr2 DT at L2 (middle panel) and 0–8 h L3 (right panel). DNA content was estimated using DRAQ5 fluorescence intensity (see methods). Plotted in the histogram are DNA content measurements from WL3 G1 (n = 13 nuclei) WL3 G2 (yellow, n = 15 nuclei), L2 (n = 23 nuclei) and 0–8 h L3 (n = 14 nuclei). (H) Cartoon showing the cell cycle program of cells in Tr2 DT at different larval stages. (I) Numbers of cells (grey bars) and Stg mRNA levels (quantitative PCR (brown bars)) in Tr2 DT at different larval stages. Graph shows cell numbers (mean ± standard deviation, n ≥5 tracheae per timepoint, grey axes) and fold change in mRNA levels with respect to L2 (mean ± standard deviation, brown axes). (J) Stg immunostaining (red) in Tr2 DT in wild type at different stages. Also shown are Tr2 DT from Btl-StgRNAi and from wild type larvae stained with the secondary antibody alone (far right panels). The distribution of Stg in the nucleus and cytoplasm can be seen in the higher magnification views of single nuclei below each panel. (K) Effect of heat shock-dependent co-expression of Stg, Cdc2 and CyclinB on cell number in Tr2 DT (mean ± standard deviation, n ≥ 5 tracheae per timepoint). DT = Dorsal Trunk,DB = Dorsal Branch, TC = Transverse Connective.Scale bar = 10 µm. Student's paired t-test: *p<0.05. n.s = not significant. For the analysis of the mechanism for G2 arrest in Tr2 we focused our attention on the cells that comprise the Dorsal Trunk (DT) in this segment (Figure 1A, demarcated with dashed lines). Tr2 DT constitutes a developmental compartment consisting of 16–18 cells that become mitotically active mid-L3 (Rao et al., 2015). To characterize when precisely cells in Tr2 DT enter and exit G2, we counted the numbers of cells at different larval stages (first instar (L1), second instar (L2), third instar (L3) (early L3, 32–40 h L3, wandering L3 (WL3)) and analyzed the timecourse of BrdU incorporation (S phase) and phospho-Histone H3 (pH3, M phase) labeling at these respective stages (Figure 1I, Figure 1—figure supplement 1). Counts of cell numbers in Tr2 DT showed that there are 16–18 cells in L1, that this number remains unchanged through 16–24 h L3, that there are 25–35 cells by 32–40 h L3 and ~250 cells at wandering L3 (WL3) (Figure 1I, n ≥ 5 tracheae per timepoint here and in all subsequent figures showing cell frequencies). BrdU incorporation in Tr2 was observed in the first larval instar (L1) and again at 32–40 h L3 but not in the interim period. Phospho-histone H3 labeling was detected from 32- 40 h L3 onwards (representative images from different stages and a quantitation of pH3+ cells at these stages is shown in Figure 1—figure supplement 1). Based on these analyses we surmised that cells in Tr2 DT complete S phase in L1 and remain in G2 from late L1/L2 till 24–32 h L3. The FUCCI (Fluorescence Ubiquitination-based Cell Cycle Indicator) system facilitates precise cell cycle staging based on the levels of expression of fluorescent reporters (Zielke et al., 2014).To characterize cell cycle phasing of cells in Tr2 DT, we expressed fluorescently tagged degrons from E2F1 (E2F1-GFP, degraded at the onset of S phase) and Cyclin B (Cyclin B-RFP, degraded in mitosis) in the tracheal system and analyzed expression of these reporters in Tr2 DT at different larval stages (Figure 1B–F, n ≥ 6 tracheae per timepoint analyzed). In this system, cells in G1 are GFP+, cells in S RFP+ and cells in G2 GFP+RFP+. We found that cells in Tr2 DT are heterogeneous with respect to reporter expression in L1 (GFP+,RFP+ and GFP+RFP+) (Figure 1B), homogeneous from L2 till early L3 (GFP+RFP+) (L2 shown Figures 1C, 0-8 h L3 not shown, 16–24 h L3 shown in Figure 1D) and heterogeneous from 32-40 hL3 onwards (GFP+, RFP+ and GFP+RFP+) (32–40 h L3 shown in Figure 1E, WL3 shown in Figure 1F). Analysis of freshly hatched L1s showed that the cells in Tr2 DT are all GFP+ (Figure 1—figure supplement 1). Taken together, FUCCI analysis show that cells in Tr2 enter larval life in G1, transition from G1 to G2 in the first larval instar (L1) and remain paused in G2 from the second larval instar (L2) till 24–32 h L3 (~48–56 h). In addition to these analyses, we also compared the DNA content of paused cells in L2 and early L3 with the DNA content of mitotically active cells in the G1 or G2 phase (G1/G2 identified by FUCCI at WL3) (Figure 1G). We noted that the DNA content of cells in L2 and early L3 was comparable to the DNA content of cells in G2. Thus, FUCCI and DNA content analyses corroborated our initial assessment of cell cycle phasing of cells in Tr2 DT during larval life (summarized in the diagram in Figure 1H). Studies in SOPs and other imaginal progenitors have shown that G2 arrest is due to the absence of Stg expression (Johnston and Edgar, 1998). To test whether this model is applicable to Tr2 tracheoblasts, we compared levels of Stg mRNA in Tr2 DT prior to and post mitotic entry using real-time PCR (qPCR) and immunohistochemistry. For qPCR analysis we micro-dissected Tr2 DT fragments from different stages and isolated RNA from these fragments (≥15 tracheal fragments per timepoint per experiment, n = 3 experiments). Levels of Stg mRNA at L2, 0–8 h L3, 16–24 h L3 and 32–40 h L3 were comparable (Figure 1I) and the level at WL3 was significantly higher than earlier stages (Figure 1I). Stg immunostaining revealed low levels of Stg, in both nucleus and cytosol, at L2, 0–8 h L3 and 32–40 h L3 (Figure 1J, n = 9 tracheae per condition per experiment, n = 3 experiments). We detected higher levels, with the same spatial distribution as earlier stages, at WL3 (Figure 1J). To confirm that the anti-Stg antibody was specific, we stained trachea from animals expressing StgRNAi in the tracheal system under the control of Btl-Gal4 (Btl-StgRNAi). Staining in these animals was comparable to the staining in specimens incubated with the secondary antibody alone indicating that the Stg staining is specific (Figure 1J). These experiments suggest that unlike SOPs, tracheoblasts paused in G2 express both Stg mRNA and protein. Next we investigated whether Cdc2/Cdk1 and Cyclin B, the other drivers of G2-M, are also expressed in tracheoblasts paused in G2. Both mRNA and protein were detected in paused cells and exhibited a timecourse of expression like Stg/Stg (qPCR data and immunostaining shown in Figure 1—figure supplement 2, qPCR as above n = 3, immunohistochemistry n = 6 tracheae per condition, n = 2 experiments). Together, the findings suggest that G2-arrested cells in Tr2 DT express all the cell cycle regulators necessary for G2-M. The expression of drivers of G2-M in paused cells was unexpected. To investigate whether mitotic arrest was due to insufficient expression, we co-overexpressed Stg, Cdc2/Cdk1 and Cyclin B in L2 and early L3 via heat shock and counted cells in Tr2 DT post heat shock. The co-overexpression of Stg, Cdc2/Cdk1 and Cyclin B did not result in increased numbers of cells (Figure 1K). This suggestedthat G2 arrest in tracheoblasts could be due to the expression of negative regulators of G2-M and/or the paucity of other positive regulators. As mentioned earlier, downregulation of Cdc2/Cdk1 activity by the ATR-Chk1 or the ATM-Chk2 kinase cascades can lead to arrest in G2. Next we investigated whether ATR and ATM have any role in the regulation of G2 arrest in Tr2. We knocked down ATR or ATM (Telomere Fusion (Tefu), hereafter referred to as ATM) levels in tracheae by RNAi (Btl-ATRRNAi, Btl-ATMRNAi) and counted the numbers of cells in Tr2 DT at L2, early L3, 32–40 h L3 and WL3. The numbers of cells in Tr2 DT in Btl-ATRRNAi larvae were significantly higher than wild type by 16–24 h in L3 (21–26 cells compared to 16–18 cells, Figure 2A) while there was no increase in cell number in Btl-ATMRNAi expressing animals. This finding implicated the ATR-Chk1 axis and not the ATM-Chk2 axis in the regulation of G2 arrest in Tr2 DT. ATR and its effector Checkpoint kinase 1 regulate G2 arrest. (A) Effect of reduction of ATR or ATM expression on cell number in Tr2 DT. Graph shows cells numbers in wild type (Btl-Gal4/+; UAS-nuGFP), Btl-ATRRNAiand Btl-ATMRNAi at different stages (mean values ± standard deviation, n = 7 tracheae per condition per timepoint). (B–C) Activated Chk1(phospho-Chk1Ser345) immunostaining (green) in Tr2 DT in wild type, Btl-ATRRNAi and Btl-Chk1RNAi. (B) phospho-Chk1Ser345 immunostaining in Tr2 DT in wild type (Btl-Gal4/+; UAS-nuGFP) at different stages (C) phospho-Chk1Ser345 immunostaining in Tr2 DT in L2 larvae from Btl-ATRRNAi (top panel) in Btl-Chk1RNAi (middle panel) and wild type treated with secondary antibody alone (bottom panel). (D) Effect of reduction in Chk1 expression in tracheae on cell number in Tr2 DT. Graph shows cells numbers in Tr2 DT in wild type (Btl-Gal4/+; UAS-nuGFP) and Btl-Chk1RNAi at different stages (mean values ± standard deviation, n = 10 tracheae per condition per timepoint). (E) Mitotic indices of Tr2 DT in wild type, Btl-ATRRNAi and Btl-Chk1RNAi expressing larvae at different stages. Graph shows the frequency of pH3+ nuclei/tracheae at the indicated stages (mean values ± standard deviation, n = 7 tracheae per condition per timepoint. (F) Effect of overexpression of Chk1 on cell number in Tr2 DT. Graph shows cells numbers in Tr2 DT in wild type (Btl-Gal4/+; UAS-nuGFP) and Btl-Chk1at 32–40 h (mean values ± standard deviation, n = 10 tracheae per condition). DAPI, blue. Scale bar = 10 µm. Student's paired t-test: *p<0.05. To investigate the role of ATR-Chk1 further, we stained larvae with antisera against an activated (phosphorylated) form of Chk1(Sørensen et al., 2004). Anti-phospho-Chk1 (pChk1) immunostaining was high in L2 and early L3 and low at 32–40 h L3 (Figure 2B, n = 6–8 tracheae per condition per experiment, n = 3) and subsequent stages (WL3, data not shown). We stained for pChk1 in Btl-ATRRNAi animals and found no detectable signal indicating that Chk1 phosphorylation is indeed ATR-dependent (Figure 2C). To confirm that pChk1 staining was specific, we stained Btl-Chk1RNAi expressing animals with the same antisera. pChk1 staining in Btl-Chk1RNAi was comparable to specimens stained with the secondary antibody alone (Figure 2C, n = 3 experiments). Next we determined whether the loss of Chk1 also perturbed the timecourse of cell proliferation in Tr2 DT. Cell counts of Btl-Chk1RNAi larvae showed that the number of cells in in Tr2 DT is higher by 16–24 h in L3 (40–50 cells, Figure 2D). In addition to counting numbers of cells, we assayed mitotic activity in Btl-ATRRNAi and Btl-Chk1RNAi by anti-pH3 immunostaining at L2, 0–8 h L3 and 16–24 h L3. As indicated in the previous section there are no pH3+ cells in wild type Tr2 tracheae at these stages (Figure 1—figure supplement 1). We observed pH3+ mitotic figures in Btl-ATRRNAi at 16–24 h and in Btl-Chk1RNAi expressing animals at 0–8 h L3 and 16–24 h L3 (Figure 2E). Whether the observed differences between Btl-ATRRNAi and Btl-Chk1RNAi are due to differences in the efficiencies of the respective RNAi lines or due to the presence of other negative regulators of Chk1 is currently unclear. Next we examined how Chk1 overexpression impacted the timing of mitotic entry in Tr2 DT. The overexpression of Chk1 under Btl control (Btl-Chk1) inhibited mitotic entry at 32–40 h L3 (Figure 2F). Based on these findings we conclude that ATR/Chk1 are negative regulators of G2-M in tracheoblasts. Despite precocious mitotic entry in ATR/Chk1-deficient animals, the numbers of cells in Tr2 DT at WL3 in these animals were significantly lower than in wild type (Figure 2A,D).To investigate whether Chk1 has a role post-mitotic entry, we expressed Chk1RNAi in the tracheal system in a timed (conditional) manner using the Gal4-UAS-Gal-80ts system (Figure 3). 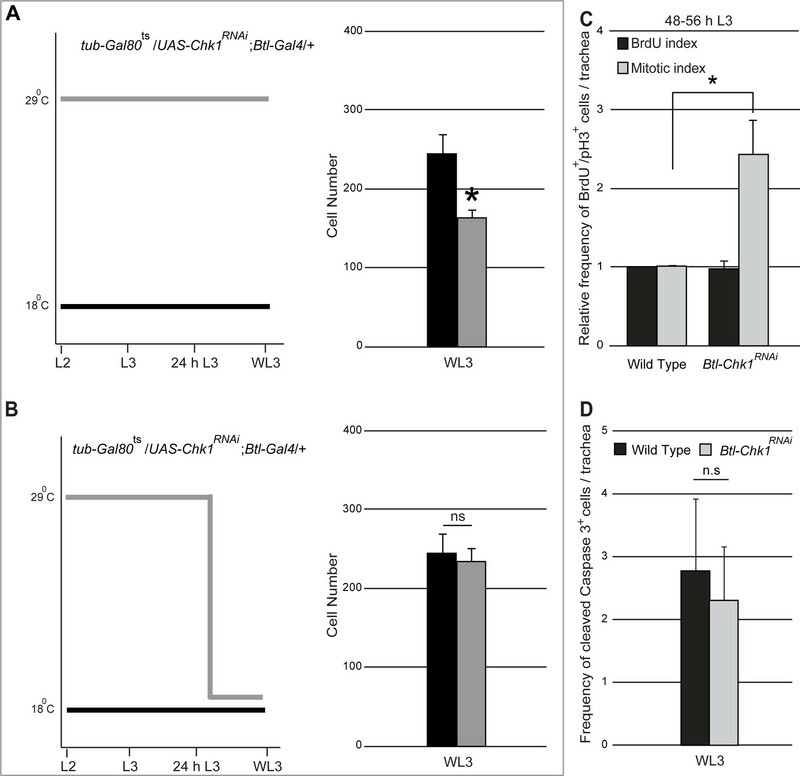 The expression of Chk1RNAi from embryonic stages (animals raised at 29°C till WL3 to inactivate Gal-80) led to a reduction in the numbers of cells at WL3 (Figure 3A). However, expression of Chk1RNAi from embryonic stages till 24 h L3 (animals grown at 29°C from embryonic stages to 24 h L3 and shifted to 18°C from 24 h L3 to WL3) did not lead to a reduction in the numbers of cells in Tr2 DT at WL3 (Figure 3B). This suggests that in addition to regulating G2-M, Chk1 has a role in tracheoblasts post mitotic entry. Role for Chk1 in the regulation of tracheoblast proliferation post mitotic entry. (A). Graph shows cell numbers in Tr2 DT at WL3 in tub-Gal80ts/UAS-Chk1RNAi; Btl-Gal4/+larvae grown at 18°C (uninduced (wild type), black) or grown at 29°C from the embryonic period (constitutively induced, grey) (mean ± standard deviation, n = 10 tracheae per condition). (B) Graph shows cell numbers in Tr2 DT at WL3 in tub-Gal80ts/UAS-Chk1RNAi; Btl-Gal4/+larvae grown at 18°C (uninduced (wild type), black, same as (A)) or grown at 29°C from the embryonic period till 24 h L3 then shifted to 18°C till WL3 (conditionally induced, grey) (mean ± standard deviation, n = 10 tracheae per condition). (C) Graph showing relative frequencies of BrdU+ or pH3+ cells in Tr2 DT in wild type (UAS-nuGFP; Btl-Gal4/TM3,Ser)and Btl-Chk1RNAi at 48–56 h (mean ± standard deviation, n = 10 tracheae per timepoint). (D) Graph showing frequency of cleaved-Caspase 3+cells in Tr2 DT in wild type (UAS-nuGFP; Btl-Gal4/TM3,Ser) and Btl-Chk1RNAi WL3 larvae (mean ± standard deviation, n = 13 tracheae each). Student's paired t-test: *p<0.05. n.s = not significant. Next we investigated whether reduced numbers of cells in Btl-Chk1RNAi at WL3 was due to decreased rate of proliferation, increased apoptosis or both. We measured the frequencies of mitotically active cells (BrdU incorporation, anti-pH3 immunostaining) and of apoptotic cells (activated Caspase3 immunostaining) in Btl-Chk1RNAi and wild type in late L3. The frequencies of BrdU+ cells were comparable in Btl-Chk1RNAi and wild type but the frequency of pH3+ cells was significantly higher in Btl-Chk1RNAi (Figure 3C). The frequencies of activated Caspase3+ cells were comparable in Btl-Chk1RNAi and wild type (Figure 3D). Together, reduced numbers of cells in Btl-Chk1RNAi in late L3 and increased frequency of pH3+ cells in these animals at the same stage suggests that cells lacking Chk1 divide more slowly on account of a prolonged M phase. These data are consistent with a previously described role for ATR-Chk1 in the regulation of the mitotic spindle during cytokinesis (Gruber et al., 2011; Tang et al., 2006). Cells in Tr2 DT enter G2 late in L1/early L2 and remain in G2 till 24–32 h L3. The loss of ATR/Chk1 results in mitotic entry in early L3, ~24–32 h earlier than normal. The reason cells in Btl-ATRRNAi/Btl-Chk1RNAi initiated mitoses in L3 but not earlier was unclear and led us to further probe the dependence on Chk1. Chk1 is thought to mediate G2 arrest by inhibition of Cdc2/Cdk1 (Xiao et al., 2003; O'Connell et al., 1997). The activation of Cdc2/Cdk1 involves dephosphorylation of residues Threonine-14 and Tyrosine-15. Chk1 may prevent activation by inhibiting the phosphatase Stg and/or by stabilizing the kinases Wee/Myt. Next we examined how expression of an ‘activated’ form of Cdc2/Cdk1 (Cdc2AF) in which Threonine-14 and Tyrosine-15 have been mutated to Alanine and Phenylalanine respectively (Chow et al., 2003; Edgar and O'Farrell, 1990), impacted proliferation. Cdc2AFwas induced via heat shock in L2, 0–8 h L3 and 32–40 h L3 and numbers of cells in Tr2 DT were counted. We observed that Cdc2AF induction in L2 did not lead to an increase in cell number but induction at 0–8 h L3 and 32–40 h L3 did (Figure 4A). We examined levels of Cdc2 expression at these stages, both prior to and post heat shock, using an anti-cdc2 antibody (n = 6 tracheae per condition per experiment, n = 3 experiments). The staining showed that Cdc2 was expressed in L2 and L3 and upregulated post heat shock (Figure 4B). We conclude that the induction of Cdc2AF is unable to induce proliferation in L2 but is able to at subsequent stages. We also co-overexpressed Cdc2AF and Cyclin B in L2 and found that this combination was also unable to induce division in L2 (Figure 4C). The inability of Cdc2AF to induce mitoses in L2 was consistent with the lack of proliferation in ATRRNAi/Chk1RNAi at this stage and implicated an ATR-Chk1-independent process in the regulation of G2 arrest in L2 (see Discussion). Expression of an activated Cdc2 (Cdc2AF) is unable to induce mitosis in L2. (A) Effect of heat shock-dependent expression of Cdc2AF on cell number in Tr2 DT at different stages. Graph shows cell numbers in uninduced (black bars) or induced (grey bars) larvae (mean ± standard deviation, n = 10 tracheae per condition per timepoint). (B) Cdc2 immunostaining (green) in Tr2 DT in hs-Cdc2AF uninduced (top left panel) and induced (top right panel) larvae in L2. Shown in the bottom panels are Cdc2 immunostaining of wild type Tr2 DT at WL3 (bottom left panel) and of wild type Tr2 DT stained with the secondary antibody alone (bottom right panel). (C) Effect of heat shock-dependent co-overexpression of Cdc2AF and Cyclin B on cell number in Tr2 DT in L2. Graph shows cell numbers in uninduced (black bars) or heat-shock induced (grey bars) larvae (mean ± standard deviation, n = 5 tracheae per condition per timepoint). Scale bar = 20 µm. Student's paired t-test: *p<0.05. Our analysis of Tr2 DT has shown that Chk1 is phosphorylated in an ATR-dependent manner (Figure 2) and that levels of pChk1 are high in L2 and early L3 and diminished at 32–40 hr L3 upon mitotic entry (Figure 2). ATR is known to be recruited to double-strand breaks in DNA that result from exposure to DNA damaging agents, collapsed/stalled replication forks during DNA synthesis or DNA recombination (Branzei and Foiani, 2008). The recruitment of ATR to DNA results in the phosphorylation of the histone variant H2AX (gamma-H2AX/gamma-H2AV in Drosophila) and other proteins including Chk1. Antisera against gamma-H2AX are able to detect DNA damage in Drosophila (Bayer et al., 2017; Rogakou et al., 1999). Larvae subject to X-ray irradiation-induced DNA damage showed increased levels gamma-H2AX staining in larval tissues (Bayer et al., 2017). To investigate whether the activation of ATR/Chk1 in Tr2 DT is associated with double-strand breaks in DNA in these cells, we examined the distribution of gamma-H2AX in L2, early L3 and WL3 (Figure 4, n = 6–8 tracheae per condition per experiment, n = 3 experiments). We detected no gamma-H2AX staining in Tr2 DT in L2 and sporadic staining in WL3 (Figure 5A–B, early L3 not shown). To validate the gamma-H2AX antisera used in our experiments we stained imaginal discs from larvae irradiated with X-rays at 20 Gy and 40 Gy, 1 h post irrradiation (n = 5–6 imaginal discs per condition per experiment, n = 2 experiments). The frequency of gamma H2AX+ cells was higher in significantly higher in treated discs than controls and higher in discs exposed to 40 Gy than 20 Gy (data not shown). Thus, we found no evidence for double-strand breaks in DNA in cells paused in G2. We also examined gamma-H2AX levels in Btl-Chk1RNAi animals to see if the levels were elevated. Here again, we detected no gamma-H2AX in L2 and some labeling, at levels comparable to wild type, at WL3 (Figure 5A–B). The sporadic gamma-H2AX staining observed in wild type and Btl-Chk1RNAi animals is intriguing and the underlying reason is currently unclear. It has been reported that the Ser-139 residue on H2AX is also phosphorylated in cells undergoing apoptosis (Rogakou et al., 2000). Since the frequencies of gamma-H2AX+ nuclei/trachea and activated-Caspase3+ cells/trachea in control and Btl-Chk1RNAi at WL3 are comparable (compare Figure 5B and Figure 3D ), it is plausible that some of the gamma-H2AX+ nuclei in control and Btl-Chk1RNAi tracheae at WL3 are apoptotic cells. Chk1 is regulated at a transcriptional level in Tr2 tracheoblasts. (A) gamma-H2AXSer139 immunostaining (red, arrowhead) in Tr2 DT in wild type (Btl-Gal4/+; UAS-nuGFP, left panels, arrowheads) and Btl-Chk1RNAi (right panels) at L2 and WL3. (B) Frequencies of gamma-H2AX stained nuclei in Tr2 DT of wild type and Chk1RNAi-expressing larvae at L2 (black bars) or WL3 (grey bars) (mean ± standard deviation, n = 7 tracheae per condition per timepoint). (C) Quantitative PCR analysis of ATR mRNA levels in Tr2 DT fragments at different stages. Graph shows fold change in mRNA levels with respect to L2 (mean ± standard deviation). (D) Quantitative PCR analysis of Chk1 mRNA levels in Tr2 DT fragments at different stages. Graph shows fold change in mRNA levels with respect to L2 (mean ± standard deviation). Scale bar = 10 µm. Student's paired t-test: *p<0.05. In an independent set of experiments, we probed the expression of ATR/Chk1 mRNA in Tr2 DT at different larval stages (L2, 0–8 h L3, and 32–40 h L3) by qPCR (≥15 tracheal fragments per timepoint per experiment, n = 3 experiments). With respect to expression at L2, levels of ATR expression were slightly increased at 0–8 h L3 (Figure 5C). Interestingly, the levels of Chk1 mRNA were ~5 fold higher at both L2 and 0–8 h L3 in comparison to 32–40 h L3 (Figure 5D). This suggests that the high levels of pChk1 in Tr2 DT in L2 and early L3 could be regulated at a transcriptional level via the regulation of Chk1 expression. The larval tracheal system consists of a network of epithelial tubes that grow in length and in circumference as the larva grows. As indicated earlier (Figure 1), Tr2 DT and the cells that comprise this segment grow in size during larval stages. Measurements of the length and width of Tr2 DT at different larval stages showed that most of the growth of this segment occurs from the time the animals enter L2 till mid-L3 (Figure 6A–B). During this period, Tr2 DT grows in length by 268 ± 32% (n = 6 tracheae) and in width by 247 ± 19% (n = 12 tracheae). We also estimated the sizes of tracheoblasts in Tr2 DT (2D area) over the L2-L3 interval. For this, tracheae were stained with Phalloidin to delineate margins of cells and cellular areas were measured (see Figure 6—figure supplement 1). Between L2 and 24–32 h L3, cells virtually doubled in size (cellular area increased by 112 ± 37% (n = 15)) (Figure 6C). Thus, analysis of the growth trajectory of Tr2 DT, and the tracheoblasts that comprise it,showed that maximal growth occurs in the period when the tracheoblasts are paused in G2. This raised the possibility that the arrest in G2 facilitates the growth of cells and the tracheal branches they comprise. Induction of precocious mitoses interferes with growth of Tr2 DT. (A) Graph shows length (μm) of Tr2 DT at different stages (mean ± standard deviation, n = 7 tracheae per timepoint). (B) Graph shows width of Tr2 DT (µm) at different stages (mean ± standard deviation, n = 7 tracheae per timepoint). (C) Graph shows area (µm2) of cells in Tr2 DT at different stages (mean ± standard deviation, n = 15 cells per timepoint). (D) Effect of Chk1RNAi or Chk1 expression in size of Tr2 DT at 32–40 h L3. Scatter plot shows length and width of Tr2 DT in tracheae from wild type (n = 6), Btl-Chk1RNAi (n = 11) and Chk1-expressing larvae (n = 7) at 32–40 h L3. (E) Model for the regulation of proliferation and growth in Tr2 DT. We propose that negative regulation of G2-M by ATR/Chk1 and by other mechanisms that regulate Cdc2/Cdk1 activity facilitate cellular growth and tracheal hypertrophy. Student's paired t-test: *p<0.05. Next we investigated how abrogating (Figure 2D) or prolonging G2 arrest (Figure 2F) impacted growth of Tr2 DT. Measurements of length and width of Tr2 DT in Btl- Chk1RNAi animals at 32–40 hr L3 showed that the growth was significantly reduced in comparison to wild type (Figure 6D, both average length and width are statistically different p<0.05, see Source data file 1). Conversely, the measurements of length and width of Tr2 DT in animals overexpressing Chk1 showed thatTr2 DT segments were significantly larger in this background (Figure 6D, p<0.05, both average length and width are statistically different p<0.05, see Source data file 1). We then compared the sizes of trachea in wild type, Btl- Chk1RNAi and Btl-Chk1 animals at 0–8 h L3 and found that they are comparable (Figure 6—figure supplement 1). Based on these findings, we conclude that ATR/Chk1-dependent G2 arrest facilitates cellular and organ growth in Tr2. Here we investigate the mechanism for and implication of G2 arrest in progenitors of adult thoracic tracheal system in Drosophila. We show that Tr2 tracheoblasts remain arrested in G2 for ~48–56 h during larval life during which the cells and the tracheae they comprise grow in size. Our findings are that tracheoblasts paused in G2 express both the essential drivers for G2-M like Cdc2/Cdk1, Cyclin B and Stg, and negative regulators of G2-M like ATR and Chk1, and that the G2-M transition in these cells involves the coordination of several genetically distinguishable processes including the downregulation of Chk1. Our analysis also reveals that arrest in G2 is necessary for growth of tracheoblasts and the tracheae they comprise. In the sections that follow we discuss the processes underlying G2 arrest, the relationship between G2 arrest and cellular growth and the broader implications of the developmental program described here. ATR/Chk1 have been implicated in the negative regulation of Cdc2/Cdk1 activity leading to a slowdown of the S/G2 phases of the cell cycle (Branzei and Foiani, 2008; Su et al., 1999; Blythe and Wieschaus, 2015). In these contexts, ATR is recruited to stalled/collapsed replication forks during DNA replication and to double-strand DNA breaks that occur upon exposure DNA damaging agents or during recombination (Kumagai et al., 2004; Blythe and Wieschaus, 2015). Recruitment of ATR leads in turn to the phosphorylation and activation of Chk1 and to the inhibition of Cdc2/Cdk1 activity. The inhibition of ATR/Chk1 has been shown to hinder completion of DNA replication and DNA repair and result in aberrant mitoses; ATR/Chk1 mutant animals are embryonic lethal (Liu et al., 2000; Sibon et al., 1999). In the context of tracheoblasts, we find that ATR/Chk1 act to arrest cells in G2. But unlike in other contexts, we find no evidence for any DNA damage in cells in which Chk1 is active nor any increase in DNA damage upon reduction of Chk1 levels and the induction of precocious mitoses. We independently measured the frequency of apoptotic nuclei in Chk1 mutants to find that it is indistinguishable from wild type. Thus, it appears unlikely that the activation of ATR/Chk1 in Tr2 DT is the outcome of the activation of the canonical DNA damage checkpoint. The mechanisms for the activation of ATR/Chk1 in Tr2 DT merit further investigation. Analysis of ATR/Chk1 expression by qPCR suggests that levels of Chk1 mRNA are significantly higher in arrested cells. Increased expression of Chk1 mRNA could contribute toward increased levels of phosphorylated Chk1 and to G2 arrest. Activated Chk1 is thought inhibit Cdc2/Cdk1 by either inhibiting Stg and/or stabilizing Wee/Myt (O'Connell et al., 1997; Xiao et al., 2003). We find that the expression of WeeRNAi and Myt1RNAi does not recapitulate the Chk1RNAi phenotype (data not shown). This suggests that Wee/Myt1 do not contribute toward G2 arrest in tracheoblasts and that Chk1 acts via the inhibition of Stg. We have examined if the precocious proliferation in Btl-Chk1RNAi animals is dependent on Stg. Counts of cell numbers in Tr2 DT in Btl-Chk1RNAiStgRNAi animals showed that there was no increase at 16–24 h L3 or at 32–40 h L3 (Figure 2—figure supplement 1). This is consistent with the possibility that Chk1 inhibits mitotic activity by inhibiting Stg. Tracheoblasts lacking ATR/Chk1 pause in G2 for 24 h (L2) and proliferate ~24–32 h prior to the normal time for mitotic entry (early L3). We find that expression of a constitutively active form of Cdc2/Cdk1, that is insensitive to ATR/Chk1, is unable to induce precocious mitotic exit in cells in L2. This shows that the mechanism for arrest in L2 is likely to be independent of ATR/Chk1. Mitochondrial fragmentation that occurs in G2 is necessary for the segregation of these organelles into daughter cells during mitosis. Several studies have shown that the inhibition of mitochondrial fission in actively proliferating cells leads to arrest in G2 (Westrate et al., 2014; Lee et al., 2014). Importantly, a recent study has shown that cells in which mitochondrial fission was inhibited were also unresponsive to expression of Cdc2AF(Lee et al., 2014). Whether the timecourse of mitochondrial fission in Tr2 DT impacts mitotic competence remains to be determined. Arrest in G2 correlates with increase in size of tracheoblasts and hypertrophic growth of the tracheal branch they comprise (DT). Based on the quantitation of tracheal size (Figure 6), we estimate that the tracheal epithelium, and at least some of the tracheoblasts that comprise it, grow in volume ~13 fold in the L2-32-40 h L3 interval. The association between G2 arrest and enormous cellular growth has been reported in other developmental contexts. Histoblasts arrested in G2 grow ~60 fold in volume (Ninov et al., 2009) and Drosophila spermatocytes arrested in pre-meiotic G2 arrest grow ~25 fold in volume (Ueishi et al., 2009). We find that abrogating G2 arrest in developing tracheoblasts via knockdown of ATR/Chk1 diminishes cellular and organ growth. Conversely, prolonging G2 arrest leads to increased growth. It is plausible that arrest in G2 facilitates cellular growth. This cellular growth may drive hypertrophic organ growth as we show here and facilitate rapid proliferation subsequently. Analysis of the mechanisms underlying hypertrophic growth in the vertebrate kidney (Shankland and Wolf, 2000) and heart (Braun-Dullaeus et al., 1999) has shown that it is associated with cells in G1 arrest. The findings presented here suggest that G2-arrested cells may also be relevant to hypertrophic organ growth and pathogenesis. Interestingly, hypertrophic cellular growth in G1-arrested cells referred to above has been shown to be dependent on the juxtaposition of cell cycle activators and inhibitors. In the context of glomerular cell hypertrophy associated with diabetic nephropathy, elevated glucose levels induced quiescent cells to enter G1 while Angiotensin II and TGF-Beta signaling elevated levels of CDK inhibitors that prevented entry into S phase (Fujita et al., 2004). The negative regulation of cell cycle progression in cells that are mitotically active may be necessary for the hypertrophic growth of G2-arrested cells as well. The following strains were obtained from repositories: UAS FUCCI, TubGAL80ts;TM2/TM6b,Tb, UAS-ATMRNAi (Bloomington Drosophila Stock Center), UAS-Chk1RNAi, UAS-StgRNAi, and UAS-ATRRNAi(Vienna Drosophila Resource Center), UAS-Chk1 (In-house fly facility). The following strains were received as gifts: Btl-Gal4, hs-String, hs-Cdc2, hs-Cdc2AF, hs-CyclinB. Strains were raised on a diet of cornmeal-agar and maintained at 25°C except hs and GAL80ts strainsthat were maintained at 22°C and 18°C respectively. For experiments involving GAL80tsstrains, the animals were moved to 29°C at indicated stages for indicated time periods. For experiments involving hs strains, the animals were heat-shocked at 37°C for 30 min at indicated stages, transferred to 22°C for 3 h and then sacrificed. Larval staging was based on the morphology of the anterior spiracles as previously described(Guha and Kornberg, 2005). For timepoints in L3, L2 larvae were collected and examined at 8 h intervals to identify animals that had undergone the L2-L3 molt (0–8 h L3). 0–8 h L3 cohorts isolated in this manner were staged for subsequent timepoints. Larvae were fed 5-Bromo-2’-deoxyuridine (1 mg/ml final concentration, Sigma, in cornmeal-agar) for 2 hr and sacrificed for analysis. Animals were dissected in PBS and fixed with 4% (wt/vol) Paraformaldehyde in PBS for 30 min. Immunohistochemical analysis utilized the following antisera: Rabbit anti-gamma-H2AX (Novus Biologics, 1:300), Rabbit anti-cleaved-Caspase3 (Cell signaling technology, 1:300),Rabbit anti-pH3 (Millipore, 1:500), Guinea pig anti-stg (gift from Dr. Yukiko Yamashita, 1:500 [Inaba et al., 2011]), Rabbit anti-Cdk1/Cdc2 (PSTAIR) (Millipore, 1:500), Mouse anti-CyclinB (DSHB, 1:300), Rabbit anti-phospho Chk1 (Abcam, 1:200), Mouse anti-BrdU (Sigma, 1:100) and Alexa 488/568/647-conjugated Donkey/Goat anti-mouse/rabbit/guinea pig secondary antibodies (Invitrogen, 1:300). Tyramide signal amplification was used as per manufacturer recommendations for pChk1 detection. As part of this protocol the following reagents were used: Tyramide amplification buffer and Tyramide reagent (Invitrogen), Vectastain A and B and Biotinylated goat anti Rabbit IgG (1:200, Vector Labs). Tracheal preparations were flat-mounted in ProLong Diamond AntifadeMountant with DAPI (Molecular Probes)and imaged on Leica TCS SP5 or Zeiss LSM-780 laser-scanning confocal microscopes. Images were processed using Image J and Adobe Photoshop. For quantification of cell number, fixed specimens were mounted in ProLong Diamond AntifadeMountant with DAPI and the number of nuclei were counted on a Zeiss Axio Scope A1 microscope. The DT of the second thoracic metamere was identified morphologically based on the cuticular banding pattern at anterior and posterior junctions. Length of DT was measured as the distance between the cuticular bands of respective metameres. Area of a cell was measured by creating a mask over the cell boundaries as stained by Alexa 568 Phalloidin (Molecular Probes, 1:500) using ImageJ. Btl-FUCCI-expressing larvae were dissected in PBS, incubated with 5 μM Draq5 (Abcam) for 5 min (PBS), fixed in 5% paraformaldehyde (PBS) for 10 min, and rinsed in PBS + 0.3% Triton X-100. Trachea were flat-mounted in 50% (vol/vol) glycerol and compressed gently to expel air from the tubes to eliminate light scattering by air-filled tracheal tubes. Nuclear regions were selected using ImageJ and intensity of DRAQ5 fluorescence was estimated.Intensities were corrected for background by subtracting an average intensity value of five selected regions devoid of nuclei from all pixels in the image. The DT of the second thoracic segment was identified morphologically as described in the previous section, micro-dissected with forceps in PBS and transferred to Trizol reagent (Ambion) on ice for RNA extraction as per instructions provided by the manufacturer. RNA was then precipitated using Isopropanol/4M Lithium chloride. cDNA was synthesized (100 ng RNA) using Maxima First Strand cDNA Synthesis Kit (Thermo Fisher). 1 μL of cDNA was then used to perform qPCR using the SYBR Green (Maxima Probe/ROX qPCR Master Mix, Thermo Fisher) protocol. Primer sequences for candidate genes and GAPDH (internal control) are provided below. Relative mRNA levels were quantified using the formula RE = 2- ∆∆Ctmethod. Nature Reviews Molecular Cell Biology 9:297–308. Journal of Clinical Investigation 104:815–823. Nature Reviews Molecular Cell Biology 14:329–340. Journal of Biological Chemistry 278:40815–40828. American Journal of Physiology-Renal Physiology 286:F120–F126. Journal of Biological Chemistry 279:49599–49608. Cellular and Molecular Life Sciences 71:711–725. The Journal of Cell Biology 146:905–916. Journal of Biological Chemistry 275:9390–9395. American Journal of Physiology-Renal Physiology 278:F515–F529. Current Biology : CB 9:919–922. Cell Structure and Function 34:61–69. Journal of Biological Chemistry 278:21767–21773. Thank you for sending your article entitled "Negative regulation of G2-M in the presence of Cdc25/String facilitates tracheoblast growth and tracheal hypertrophy in Drosophila" for peer review at eLife. Your article has been favorably evaluated by Didier Stainier (Senior Editor) and three reviewers, one of whom is a member of our Board of Reviewing Editors. The reviewers have discussed the paper amongst themselves and come to the conclusion that the paper has merit but is not publishable in its current form, however it could be with very substantial revisions. Overall, the reviewers were convinced that the ATR-Chk1 checkpoint controls the cell cycle during tracheal development, and felt that this was an interesting use of the checkpoint in development that warrants reporting in eLife. However the reviewers were not as convinced by the data on mitochondrial regulation of the cell cycle, or growth control by Stg, and felt that more data would be required to support these aspects of the paper. Thus we'd like to suggest two options you might follow in revising the paper. First, we think you could remove the data on mitochondria and PINK1, and also the data on Stg and growth, and submit a shorter, simpler paper including only the data relevant to the ATR-Chk1 mechanism, which the reviewers felt was relatively strong. This is your simplest option and could probably be achieved in a reasonable timeframe. Second, an alternative would be to provide a revision with more data from new experiments addressing mitochondrial fission, PINK1, and Stg-mediated growth. In this case the reviewers would have to be convinced by the new data, and its relevance to the ATR-Chk1 checkpoint. I expect this will be significantly more complex and time-consuming than option #1. In this paper, Guha et al. report a study of cell cycle control during tracheal growth in the Drosophila larva. The authors have made several interesting observations. 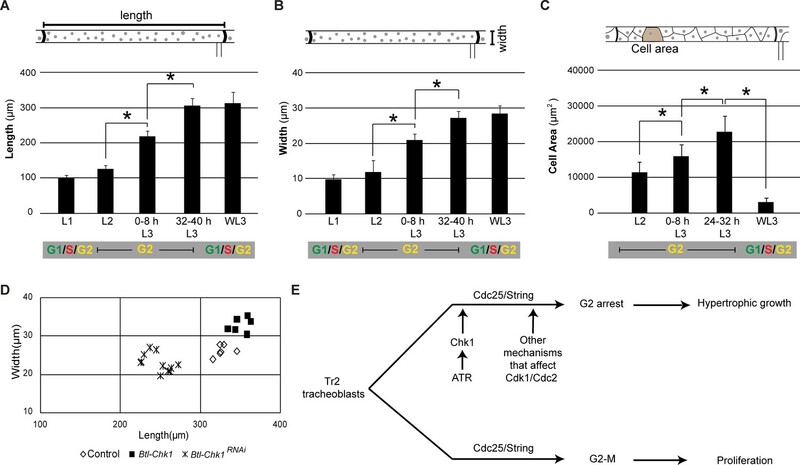 First, tracheoblasts undergo prolonged arrest in G2, and this is mediated in part by inhibition of M-CDK by the well-known ATR-Chk1 system, normally used in response to DNA damage, or incomplete replication. They've also identified an inhibitory role for mitochondria, which need to undergo fission for efficient mitosis, but remain fused during the G2 arrest, apparently inhibiting mitotic progression. The authors provide a careful analysis of cell cycle phenotypes and use a number of excellent genetic tests to demonstrate how the G2 arrest is mediated by ATR/Chk1 and mitochondrial fission. Although there are a number of technical weaknesses that should be addressed (see details below), the demonstration of G2 arrest and its regulation by ATR/Chk1 is convincing enough. The interesting aspect for a general audience is that ATR/Chk1 are used here as developmental regulators rather than in DNA damage response, and there are not very many examples of this general mechanism. The paper stops short of determining how ATR/Chk1 and mitochondrial fission are regulated developmentally. This would of course be nice to know, but isn't essential to make this study valuable. At the end of their paper the authors show some data (Figure 5-6) suggesting G2 arrest promotes growth, and that stg/Cdc25 promotes ribosome biogenesis and interphase growth of tracheoblasts, but this is very preliminary, not directly relevant to the paper's central message. I suggest that this data be removed, and the work on ATR/Chk1 presented a short report. 1) Although the authors' analysis of the tracheoblast cell cycle is careful, they have not measured DNA. As a 4N DNA content is the best marker for G2 arrest, this should be done. The FUCCI markers could be misleading if the arrest mechanism is unusual (subsection “Thoracic tracheoblasts arrested in G2 express Cdc25/Stg and other mediators of G2-M”, second paragraph). 2) Figure 1. Showing a schematic summary of the FUCCI data here, without showing real data, is not acceptable. I suggest that some part of the actual FUCCI data be included in the main figure. 3) The authors argue that stg is expressed during the G2 arrest, and imply that the levels should be sufficient to trigger M phase. However the data don't really support this. Stg levels clearly rise as the cell begin to divide, and the lower levels may be sub-threshold. There is not data in the paper to rule this out, so I suggest the authors moderate their statements that Stg is present during G2 arrest. These statements, in the title, Abstract, and elsewhere are misleading. 4) Figure 2. Tp bolster their analysis and cement their conclusions, the authors should quantify numbers of PH3 figures at timpanist in the WT and Chk1-RNAi and/or ATR-RNAi animals. The one Ph3 figure shown is not even obviously in a dividing cell, and the reliance on cell number counts raises some issues as cell death also occurs in this organ at this time. 5) Figure 3 shows some very raw data that is not obviously conclusive. I suggest the authors design a better experiment to test their idea and present that instead. As is, this figure doesn't add much to the paper. Clonal analysis might be useful here. 6) Better data are required to document the onset of mitochondrial fission in L3. Ideally this data will be quantitative. They should also provide data showing that PINK1 promotes mitochondrial fission in their system. 7) The additional mitoses generated by promoting mitochondrial fission by PINK1 are a relatively few. The authors make a lot of this small effect, but it's not clear that the combination of Chk1 loss and PINK1 completely relieves G2 arrest. From Figure 4F it looks like it does not. Perhaps the induction of Stg in L3 is important, or some other mechanism. The authors should take this into account in their Discussion. 8) The section on growth in G2 is rather descriptive, and the effects of PINK1 and Chk1-RNAi are small and perhaps insignificant. Looking at this data, I would conclude that PINK1 may inhibit growth, not that G2 arrest promotes it. I suggest removing this inconclusive data (Figure 5). 9) As noted above, I suggest removing the data shown in Figure 6, since it is very preliminary and not directly relevant to the paper's central message. The authors investigated how tracheoblast proliferation is regulated during a stage of development when cells become arrested in G2 phase and grow rapidly before re-entering a proliferative phase shortly before pupariation. Unexpectedly the mitotic activator Cdc25 (Stg) as well as activated Chk1 (a negative regulator of mitosis), were both present in these G2 phase arrested cells. Tissue-specific RNA interference against known G2/M regulators indicated that ATR/Chk1 activity was at least partially responsible for maintaining the G2 arrest during L3. This seems plausible since Chk1 is known to negatively regulate Cdc25 and positively regulate Cdk1 inhibitory kinases to prevent mitosis in undamaged cells. Next they investigated why cells were refractory to induction of precocious mitosis during L2. Expression of Cdk1AF and Cyclin B had no effect in L2 but the cells became susceptible in early L3. Since previous work in other labs showed that interfering with mitochondrial fission could block cell cycle progression they used a reporter to study the behavior of this organelle during tracheal development. They observed a transition in mitochondrial morphology from fused to fragmented preceding the onset of cell proliferation later in L3. To examine how this mitochondrial behavior affected the cell cycle they induced mitochondrial fission prematurely by expressing the PINK1 kinase and observed that susceptibility to premature mitosis by expression of Cdk1AF or Chk1 siRNA was also advanced. This also resulted in a substantial decline in growth of the trachea. These findings suggested that a 'mitochondrial' checkpoint may be operating during earlier developmental stages of the G2 phase arrest to maintain cells in a state compatible with the onset of rapid growth of the trachea. After knocking down Stg to prevent mitosis in late L3 they observed a similar growth reduction and correlated it with a decrease in the nucleolar protein synthesis marker Fibrillarin. In contrast, such treatments had no effect on an adjacent population of tracheoblasts that are endoreplicating. Collectively, these observations led them to the provocative conclusion that Cdc25 is required for growth in this particular developmental context. Such a mechanism for coordinating growth and proliferation has not previously been described to my knowledge. The manuscript was clearly written and the experiments appear to have been carefully controlled and quantified. Many of the figures were difficult to view however (horizontal orientation). The manuscript by Guha and colleagues examines G2-M regulation in the Tr2 metamere of the Drosophila trachea. Interestingly, cells in this region of the trachea have been previously shown to be both functional as tracheal cells in the larvae and then to act as adult progenitors. Here, Guha et al. explore cell cycle regulation in this distinctive group of tracheal progenitors. Using FUCCI, they define a prolonged G2 in TR2 cells. Using assays for protein and mRNA expression along with genetics, they convincingly show that ATR/Chk1 and Stg are both present during the prolonged G2, and that Chk1 represses premature mitotic entry. Also convincing are the data supporting cell growth during prolonged G2. Less convincing is the authors' argument that mitochondrial dynamics are important for G2 arrest. The authors present images of mitoGFP as evidence of developmental changes in mitochondrial dynamics, which they argue are altered when Cdc2 activity is manipulated. I find these data unconvincing and can't tell what is being assayed, and there is no quantitation of such data to speak to reproducibility. EM may be needed to more directly assay mitochondrial dynamics. Further, overexpression of a single mitochondrial regulator (pink1) is presented as additional evidence of the role of mitochondria in cell cycle regulation. In addition to being an ectopic gene expression experiment, the effects are relatively minor, and it's unclear whether any effects on cell cycle/cell size are in any way directly altering cell cycle regulation. Messing with mitochondria may disrupt cell fate, which could cause premature cell cycle entry, for example. Additional genetic evidence of a specific role for mitochondrial dynamics is definitely needed. I was also confused by the author's interpretation of the loss of cells in Chk1 RNAi animals at wandering L3, which they attribute entirely to long mitosis, as opposed to premature mitotic entry. First of all, they directly contradict this interpretation on line 243, where they say that Chk1 loss leads to earlier than normal mitotic entry. Second, longer mitosis on its own should not lead to drastic changes in cell number, as mitosis is usually a very small fraction of the cell cycle. Perhaps in the absence of chk1 there are aberrant mitoses, which lead to cell elimination by a non-apoptotic means, as is widely reported in numerous systems? This possibility is not discussed. Thank you for resubmitting your work entitled "Negative regulation of G2-M by ATR (mei-41)/Chk1(Grapes) facilitates tracheoblast growth and tracheal hypertrophy in Drosophila" for further consideration at eLife. Your revised article has been favorably evaluated by Didier Stainier (Senior Editor) and three reviewers, one of whom is a member of our Board of Reviewing Editors. The manuscript has been improved a great deal, and the reviewers found the simplified format much superior. However, the reviewers have raised additional points, mostly about presentation, that need to be addressed before acceptance. These are outlined below in the full reviews. We expect that these issues should be fairly easy to address, and look forward to a further revision. The revision of this paper follows the plan agreed upon after the first review, namely to simplify the paper by deleting some weak data and focus the presentation on the novel, interesting cell cycle effects that were discovered during tracheal development. The paper is now concise and largely convincing in its conclusions. However it still has six figures, and I suggest that some of these could be combined, since they are small. The quality of the data has also been improved with some additions as suggested in the reviews. I think the paper is essentially appropriate for publication in this form. However upon reading it, I did note several instances where the data, or the presentation thereof, could be improved. I invite the authors to address these specific points with a further round of minor revisions. 1) For Figure 1, it would be very helpful to provide a graph of PH3+ cell counts at the different stages shown with the other cell cycle markers. 2) Also for Figure 1, the graph showing DNA contents (Figure 1G) is rather confusing. I suggest graphing this data as in Figure 1I, with stage on the X axis and% cells with different ploidies on the Y axis. 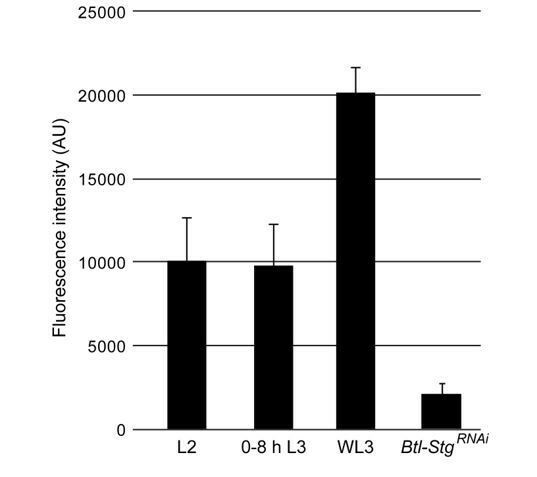 3) For Figure 2, we should see an increase in PH3+ cells in the Btl>ATR-RNAi and Btl>Chk1-RNAi samples. Please count the numbers of PH3+ cells for these genotypes and provide graphs. The data as is is substandard. 4) For Figure 6D, the authors should add p values for the growth increases and decreases. Pictures of the larger and smaller trachea would also be nice (but not essential. 5) Regarding Figure 6 and the statement at the beginning of the Discussion, I believe the Btl>Chk1-RNAi trachea have fewer cells due to effects earlier in development (noted earlier in the paper). This reduction in cell numbers might explain their smaller size. The authors should consider this problem with their interpretation and provide additional data using the Btl-TS driver if necessary. If no new data is provided the conclusion may have to be changed. 6) Please provide a citation for the statement in the last paragraph of the subsection “Fused, not fragmented, mitochondria contribute to G2 arrest in tracheoblasts”. Temporal coupling of the G2/M transition with terminal cell fate determination has been well-studied in situations where inhibitory phosphorylation of Cdk1 and lack of Cdc25 (Stg) expression ensure G2 phase arrest. Circumstances where G2 phase arrested cells undergo rapid cell growth followed by a burst of proliferation are less well understood. Such a system was studied here, the Tr2 tracheal system, where Cdc25(Stg), Cdk1 and mitotic Cyclin B were present throughout larval development yet cells remained arrested in G2 phase. RNA interference experiments showed that knockdown of the Chk1 (Grp) checkpoint kinase or to a lesser extent ATR (Mei-41) resulted in precocious mitosis in these cells during early L3 phase shortly before they would normally undergo a hyperproliferative state. These data support a developmental role for Chk1 (and ATR) in maintaining G2 phase. Although the mitotic index was elevated under these RNAi conditions, cell counts in late L3 indicated that the numbers of cells and the size of the trachea were actually reduced. Perturbation of the cell cycle therefore alters the normal balance of proliferation and growth characteristic of this tissue although how this occurs was not explained. Curiously, G2 phase arrested Tr2 cells were refractory to both checkpoint inhibition and ectopic activity of Cdk1 earlier in larval development, apparently by a novel mechanism. I look forward to hearing about their future work on this aspect of tracheal development. I found the revised manuscript considerably improved, with the logical flow of the experiments much easier to follow. The figures were clear and the data convincing. Overall, the authors present a very nice story about ATR/chk1-dependent G2 lengthening as an important mechanism in building the fly trachea. I have a number of comments about data presentation that should be addressed to make the manuscript suitable for publication. The graph in Figure 1G is non-intuitive. Please re-configure. It appears that two different things are being plotted on the graph, and "DRAQ5 Intensity bins" as an axis label does not convey any clear meaning. Figure 1I- Can the authors more directly address how it was determined that the pre-WL3 levels of mRNA are or are not significantly above the level of background detection? Stg RNAi seems like a good control to do here. In several places, I could not find clear information on the N values for experiments, or any information on how many times an experiment was replicated. For example, Figure 1J. How many times were the control and stg RNAi experiments performed? Every experiment should have information on N values and replicates. For Figure 1J, how was the difference in stg protein expression normalized between control and stg RNAi animals? Please provide some quantitative data with replicates for this experiment. Similar comment for the cdc2 staining in Figure 4. How do we know that the ATM RNAi is a valid reagent, given the negative result? Has this RNAi line been validated in other publications? The authors do not comment on the dramatic difference in cell # increase between ATR and chk1 RNAi. Why would ATR knockdown be less efficient? Can the authors comment on whether the ATR RNAi is less effective, or whether redundant chk1 regulators may be involved? If neither possibility can be ruled out, at least note the difference, as it is striking in Figure 2. Figure 5 – the Γ H2AX staining experiment lacks a positive control (such as staining after X-irradiation). Also, it's not clear to me what the single labeled nuclei labeled by this mammalian antibody are detecting. Why not use γ H2AV instead? In Figure 5A, for the WL3 RNAi condition, the DAPI image has grid lines over it. Can the authors provide a better image? […] Overall, the reviewers were convinced that the ATR-Chk1 checkpoint controls the cell cycle during tracheal development, and felt that this was an interesting use of the checkpoint in development that warrants reporting in eLife. However the reviewers were not as convinced by the data on mitochondrial regulation of the cell cycle, or growth control by Stg, and felt that more data would be required to support these aspects of the paper. Thus we'd like to suggest two options you might follow in revising the paper. We would like to take option (1). The revised manuscript has focused on the role of the ATR-Chk1 pathway in developmental G2 arrest. We have omitted the sections on mitochondrial remodeling and the role of Stg in growth. […] The interesting aspect for a general audience is that ATR/Chk1 are used here as developmental regulators rather than in DNA damage response, and there are not very many examples of this general mechanism. The paper stops short of determining how ATR/Chk1 and mitochondrial fission are regulated developmentally. This would of course be nice to know, but isn't essential to make this study valuable. We thank the reviewer for the insightful and generous appraisal of our work. We are currently investigating the mechanisms that regulate ATR-Chk1 and mitochondrial fission-fusion by way of a genetic screen. The characterization of the hits that have emerged from this screen is underway but too preliminary to report here. At the end of their paper the authors show some data (Figure 5-6) suggesting G2 arrest promotes growth, and that stg/Cdc25 promotes ribosome biogenesis and interphase growth of tracheoblasts, but this is very preliminary, not directly relevant to the paper's central message. I suggest that this data be removed, and the work on ATR/Chk1 presented a short report. We agree and have revised the figures and the text to this effect. The analysis of DNA content of larval tracheal cells has been reported previously (Guha et al., 2008 and Sato et al., 2008). These studies show that the DNA content of mitotically competent Tr2 tracheoblasts decreases in the L2-L3 interval in contrast to the DNA content of endoreplicating tracheal cells that increases in the same interval. The analyses also show that the DNA content of cells in G2 arrest is higher than that of cells that are actively cycling but do not specifically address whether the DNA content of arrested cells is ~4N. To address whether G2-arrested cells are ~4N we have compared the DNA content of proliferating Tr2 tracheoblasts in G1 and G2 and the DNA content of Tr2 tracheoblasts in L2 and 0-8 L3 h L3. The cells in G1/G2 at the wandering L3 stage were marked by FUCCI. A histogram showing the DNA content at all of the abovementioned stages is shown in Author response image 1. This histogram reveals that the Tr2 tracheoblasts in L2 or 0-8 L3 have a DNA content that is comparable to the DNA content of proliferating tracheoblasts in G2. We infer that the DNA content of the arrested tracheoblasts is ~4N. This data has been included in Figure 1 (Figure 1G) to substantiate our claim that the arrested cells are in G2. Comparison of the DNA content of actively dividing cells in Tr2 DT in G1 and G2 at the wandering L3 stage (FUCCI) and cells in Tr2 DT at L2 and 0-8 h L3. 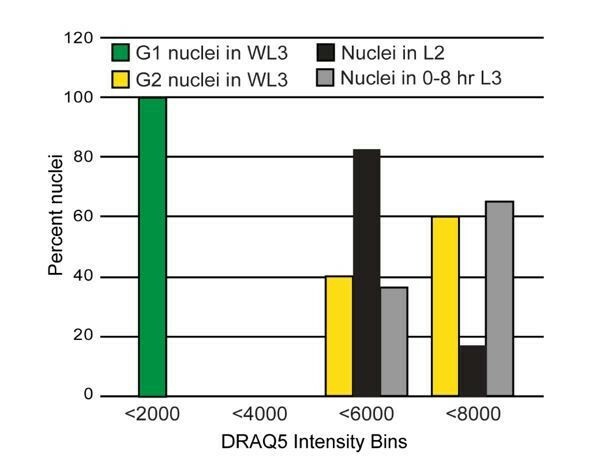 Histogram shows percent nuclei from WL3 in G1 (green, n=13) or G2 (yellow, n=15), L2 (black, n=23) and 0-8 h L3 (grey, n=14) in each DRAQ5 intensity bin (DNA content). We have also repeated our BrdU incorporation studies in animals in L2, L3 and in animals fed BrdU through the L2-L3 molt. We do not detect any BrdU incorporation in Tr2 DT in any of these conditions. We have revised Figure 1 to include FUCCI. We think our data is consistent with the possibility that levels of Stg mRNA/protein in cells that are arrested is sufficient for mitotic entry. As we have shown, levels of Stg mRNA/protein in cells at the time cells enter division (32-40 h L3) is not significantly higher than when the cells are arrested (L2, 0-8 h L3, 1624 h L3). The levels of Stg mRNA/protein increase after the cells enter mitosis. We have now also assayed the levels of Stg mRNA/protein in animals that express Chk1RNAi and divide precociously at 16-24 h L3. We find that Stg mRNA/protein levels in these mutants at 16-24 h L3 are comparable to control (G2-arrested) at the same stage. Thus, we find no evidence for the upregulation of Stg at the time the cells enter mitosis. It is plausible that the levels of Stg in arrested cells is sufficient for mitotic entry and that the observed upregulation of Stg contributes toward rapid proliferation thereafter. We think that Stg is expressed in cells in G2 arrest and that comments about the dynamics of Stg mRNA are not central to the narrative. Thus they have been omitted from the revised version. With regard to revising the title and Abstract, we have now focused on the role of ATR-Chk1 in the context of G2 arrest and the possible developmental significance of the G2 arrest as inferred from the loss Chk1 (please see response to comment #8). We have quantified the frequency of pH3+ figures in wild type and Btl-Chk1RNAi animals at 0-8 h L3. While Tr2 DT in wild type animals have NO pH3+ figures at this stage (0%, n=24 tracheae), 20% of Tr2 DT in Btl-Chk1RNAi animals have pH3+ figures (n=30 tracheae). We infer that there is precocious mitotic entry in Btl-Chk1RNAi animals at 0-8 h L3 and this leads to increased numbers of cells at 16-24 h L3. This data has been included in the text. The reason this data has been included in the paper is it speaks to the roles of Chk1 in the regulation of mitotic entry and in the regulation of the rate of proliferation post mitotic entry. We have clarified this in the text and reformatted the figure to communicate what is strictly necessary. We appreciate these are important concerns. Our intention is to communicate that G2 arrest in tracheoblasts involves the coordination of genetically distinct processes and that Chk1 activation is but one of these. Thus, we have included data concerning responsiveness (or lack thereof) to Cdc2AF overexpression. Since the data on the timecourse and regulation of mitochondrial architecture is not strictly necessary it has been omitted. We recognize that this is an important concern. Please see response to comment#6. a) Maximal cell and organ growth occurs while the cells are in G2 arrest (Figure 6AC). b) The loss of Chk1 leads to precocious mitotic entry and perturbs growth such that Tr2 DT does not grow to the requisite size. The data on the role of Chk1 in growth has been included in the revised manuscript (Figure 6D). c) That the overexpression of Chk1 prolongs G2 arrest and leads to increased tracheal size (Figure 6D). We recognize that these data do not reveal whether arrest in G2 directly or indirectly (e.g. via regulation of cell fate) contributes toward cellular and organ growth. Regardless, we think that the association between arrest in G2 and growth is fairly clear and that our genetic data suggests a functional role for this type of cell cycle arrest. We agree that the data pertaining to the role for Stg in growth is not relevant and has been omitted from the revised manuscript. […] The manuscript was clearly written and the experiments appear to have been carefully controlled and quantified. Many of the figures were difficult to view however (horizontal orientation). We regret the inconvenience caused by horizontal orientation. […] Using assays for protein and mRNA expression along with genetics, they convincingly show that ATR/Chk1 and Stg are both present during the prolonged G2, and that Chk1 represses premature mitotic entry. Also convincing are the data supporting cell growth during prolonged G2. In the revised manuscript we have focused on the role of the ATR-Chk1 axis in developmental G2 arrest and omitted the sections on mitochondrial architecture and the role of Stg in growth. In the first paragraph of the subsection “Fused, not fragmented, mitochondria contribute to G2 arrest in tracheoblasts”, we state the observation that cells expressing Chk1RNAi enter mitosis precociously. If these cells were to proliferate at the same rate as in control animals we would expect supernumerary cells at wandering L3. However, this is not the case. We think that Chk1 has two distinct roles in the regulation of cell proliferation in Tr2. First, Chk1 prevents precocious mitotic entry. Second, Chk1 enables faster mitoses. There is a precedence for the latter in cultured cells and in other contexts and our data is consistent with this. We would prefer to leave the main figures unchanged if that is permissible. A graph showing frequency of pH3+ cells/tracheal segment (mitotic index) at different larval stages has been included in Figure 1—figure supplement 1. This graph shows that the cells in Tr2 DT are quiescent in L1, L2, 0-8 h L3, 16-24 h L3 and mitotically active 3240 h L3 onwards. This is consistent with the timecourse of cell numbers shown in Figure 1I. The text has been revised accordingly. The data is now presented in three separate panels. We hope that this representation clearly shows that the DNA content of arrested cells in L2 and early L3 is comparable to the DNA content of proliferating cells in G2 at WL3. A graph showing the frequencies of pH3+ cells/tracheal segment in Btl-ATRRNAi and BtlChk1RNAi in L2, 0-8 h L3, 16-24 h L3 has been included in Figure 2 (Figure 2E). Please note that the timecourse of pH3+ cells in wild type has been added to Figure 1—figure supplement 1. A statement regarding statistical significance and a reference to the raw data/statistical analysis in Figure 6—source data 1 has been added. The numbers of cells in Tr2 DT in wild type and Btl-Chk1RNAi animals are comparable starting out (L2, 0-8 h L3, see Figure 2D). At 32-40 h L3, the numbers of cells in Btl-Chk1RNAi tracheae are higher than wild type as the cells in these tracheae enter mitoses earlier (see Figure 2). Shown in Figure 6 are the sizes of Tr2 DT in wild type and Btl-Chk1RNAi animals at 32-40 h L3, a stage at which there are more cells in Btl-Chk1RNAi than in wild type. We have also included in Figure 6—figure supplement 1 a plot of the sizes of Tr2 DT in wild type and Btl-Chk1RNAi animals at 0-8 h L3. Together, the sizes of tracheae at 0-8 h L3 and at 32-40 h L3 show that in Chk1 mutant animals the growth of Tr2 DT in the early L3 period is what is affected. The citations Xiao et al., 2003 and O'Connell et al., 1997 have been added to the text. The data is now presented in three separate panels. We hope that the data now clearly shows that the DNA content of cells in L2 and early L3 is comparable to the DNA content of proliferating cells in G2. The goal of the qPCR analysis was to determine if there is a transcriptional upregulation of Stg at the time of mitotic entry. Our analysis shows that there is no significant increase in the levels of Stg mRNA at the time of mitotic entry. We have not tried to determine whether the pre-WL3 levels of Stg mRNA are or are not significantly above “background”. All we would like to show here is that we do not detect a significant increase in levels of expression at the time the cells enter mitosis. We have revised the text to include information about N values for all experiments and immunostaining experiments in particular. The staining shown in Figure 1J is representative of 3 independent immunohistochemical experiments in which at least 9 tracheae from each of the conditions shown were stained, examined by eye and then taken for imaging (stages are L2, 0-8 h L3, 32-40 h L3, Wandering L3 StgRNAi L2, and secondary alone control Wandering L3). The stained samples were mounted in ProLong Diamond with DAPI and imaged using a confocal microscope on the same day using the same imaging parameters. The laser power and gains were set in each experiment using specimens stained with the secondary antibody alone as the baseline. Any reported change in the level of staining is relative to level of staining in tracheae incubated with the secondary antibody alone. Author response image 2 shows the average intensity values for Stg staining at L2, 0-8 h L3 and WL3 from 5 Tr2 tracheae each and 3 tracheae from StgRNAi (intensity measurements were made on flattened z-stacks of Tr2 tracheae using Image J). The images used for the quantitation in Author response image 2 were randomly picked from our sample set. The staining for Cdc2 and CycB shown in Figure 1—figure supplement 2 is representative of 2 independent immunohistochemical experiments in which at least 6 tracheae from each of the conditions shown were stained and imaged as for Stg (L2, Cdc2/CycB RNAi L2, and secondary alone control L2). In addition to this we have also examined levels of Cdc2 and CycB in 6 tracheae each at 0-8 h L3, 32-40 h L3 and Wandering L3 in 2 independent experiments though this data has been shown. The staining for Cdc2 shown in Figure 4 is representative of 3 independent immunohistochemical experiments in which at least 5 tracheae from each of the conditions shown were analyzed (L2 hs/no-hs Cdc2AF, wild type wandering L3, no primary wandering L3). The same line has been validated in another study (cited below) and this reference has been added to the text. Kerry Flegel, Olga Grushko, Kelsey Bolin, Ellen Griggs and Laura Buttitta (2016). Roles for the Histone Modifying and Exchange Complex NuA4 in Cell Cycle Progression in Drosophila melanogaster GENETICS 203(3), 1265-1281. We have noted these possibilities in the text. While the γ H2AX antibody that we have used is raised against a conserved Serine residue at the C-terminal of the mammalian H2AX protein, antibodies raised against this pSer have been shown to cross react with Drosophila γ-H2AV (see Rogakou et al., 1999). Thus, the γ H2AX antibody is likely detecting γ-H2AV in our samples. Antisera against γ-H2AX antibody have previously been used to detect DNA damage in Drosophila. Bayer and colleagues (Bayer et al., 2017) have shown larvae exposed to X-ray irradiation undergo DNA damage (see Bayer et al., 2017). The same study reported that levels γ-H2AX staining in larval tissues exposed to X-tray irradiation (40 Gy) were higher than in controls. As part of our initial characterization of the gammaH2AX antibody that we have used in this study, we subject wandering L3 larvae to X-ray irradiation (20Gy, 40 Gy) and stained imaginal discs from treated larvae 1 h post irrradiation with the antibody. We observed that the frequency of γ H2AX+ cells increased from 20 Gy to 40 Gy (see Author response image 3). We concluded that the γ-H2AX antibody was detecting DNA damage in Drosophila cells. We have added a description of the positive control to the text. The occurrence of γ-H2AX+ nuclei in control animals at wandering L3 is intriguing. It has been reported that cells undergoing apoptosis also phosphorylate the Ser-139 on H2AX (see Rogakou et al., 2000). Thus, it is plausible that some of the γ-H2AX+ nuclei in control and Btl-Chk1RNAi tracheae at Wandering L3 are in fact apoptotic cells. Consistent with this, we note that the frequencies of γ-H2AX+ nuclei and activated-Caspase3+ cells in control and Btl-Chk1RNAi are comparable (Control: γ-H2AX+=1.57 ± 0.53 (n=7), activated Caspase3+=2.77 ± 1.17 (n=13); Btl-Chk1RNAi: γ-H2AX+=1.43 ± 0.53 (n=7), activated Caspase3+=2.3 ± 0.85 (n=13)). We have mentioned this in the text. We thank Bruce Edgar, Norbert Perrimon, Christian Lehner, Shigeo Hayashi, Nikita Yakubovich and Patrick O'Farrell for fly strains, Yukiko Yamashita for providing us with Cdc25/String antibody, the Central Imaging and Flow Cytometry Facility (CIFF) at inStem and Fly Facility at C-CAMP for their support, Priyasha Mishra for technical assistance, Volker Hartenstein for sharing images of the larval tracheal system, and Apurva Sarin, Tina Mukherjee,Sunil Laxman and Narmada Khare for critical reading of the manuscript. Support: Ramalingaswami Fellowship (Department of Biotechnology, Government of India, AG) and institutional funds from inStem (AK, AB). © 2018, Kizhedathu et al.